As the hot weather settles in, many Phoenix area homeowners will begin to spend more time indoors to stay as comfortable as possible. However, one of the drawbacks to living in Arizona is the fact that our energy bills tend to skyrocket between the months of May till September. However, did you know that you save money and increase the comfort of indoor living by replacing your old incandescent light bulbs with energy efficient LED lighting? There are several myths about LED lighting. First, LED Lighting is not expensive. As technology has improved, the ability to manufacture LED lighting has become easier and less cost-prohibitive. The direct result is the energy savings are passed along to the consumer. 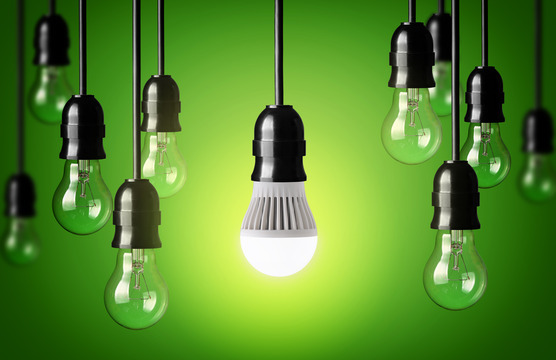 Second, LED lighting is about 6-times as efficient as incandescent lighting. In fact, if you simply replace 15 incandescent light bulbs with new LED bulbs, it’s estimated that you can save about $50.00 per year on your energy bills. Although simply replacing your bulbs to LED is a great way to save money and improve the lighting inside your home, there are several new light fixtures that are specifically engineered to work better with LED lighting. Many of the cool features of these type of fixtures is that they often come with dimming features, allowing you to create a custom look and feel that will enhance the style of any home. Plus, these new LED lighting fixtures tend to produce less heat, which will keep the inside of your home cooler in the summertime. Applying to ceilings – especially coved ceilings to create a great lighting effect. Toe kicks in cabinet lighting or in kitchens. Lighting outdoor walkways, window trims and even tabletops. LED lighting controls, such as occupancy sensors and timers, are great for saving electricity and timing the use of lighting around the home. Most of these control modules are easy to use – especially when a professional electrician takes care of the job of installing and setting them up for you. They can be set up to control virtually every LED lighting fixture inside your home. The key is to buy lighting control products that are compatible with the LED bulbs you intend on purchasing. If you’re the type of person that enjoys outdoor activities, installing LED lighting outdoors is a smart choice. A great way to enhance the look of your home, and also provide a little bit of safety and security to those visiting, is to install outdoor LED lighting. Traditionally these lights are placed along walkways to ‘light the path’ towards your home. However, you can also install LED lighting on the fence, on your patio and even on the garage. LED lighting has become more affordable than ever before. So take the time and effort to spruce up your home with new LED lighting and controllers, which will save you time, money and improve the overall comfort of your home. Curious how a change in your home lighting or business lighting could help you with efficiency and money savings? Call us today for a free consultation at 602-861-9559.